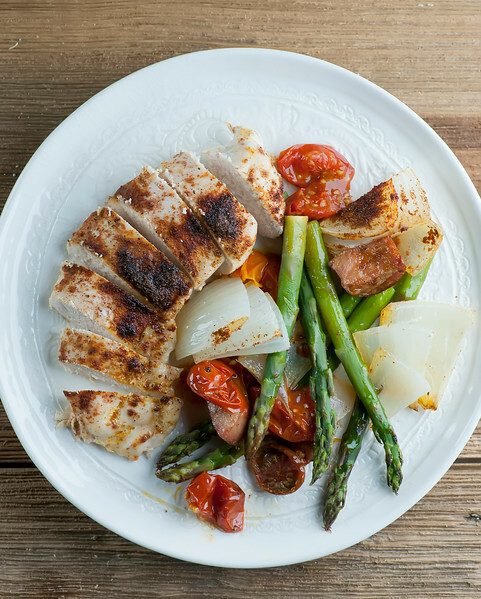 This quick recipe for spicy sheet pan chicken and sausage features cherry tomatoes, asparagus and spices, all on pan! So many delicious tastes and so little time cleaning up after – what could be better? One of the most popular recipes here at Framed Cooks is the one for sheet pan chicken and vegetables, and it’s also one of the recipes that actually gets repeated on a regular basis in my kitchen amid all the new recipes I am forever writing and testing, because it is so easy, so scrumptious and there is exactly one pan to clean up after supper. And because I can never leave well enough alone, I decided to sass this trusty recipe up a little with some different veggies and some sausage, and now I am torn between which one is my favorite. So if you want to add a little flare to your chicken and vegetables, come on with me and let’s make it! 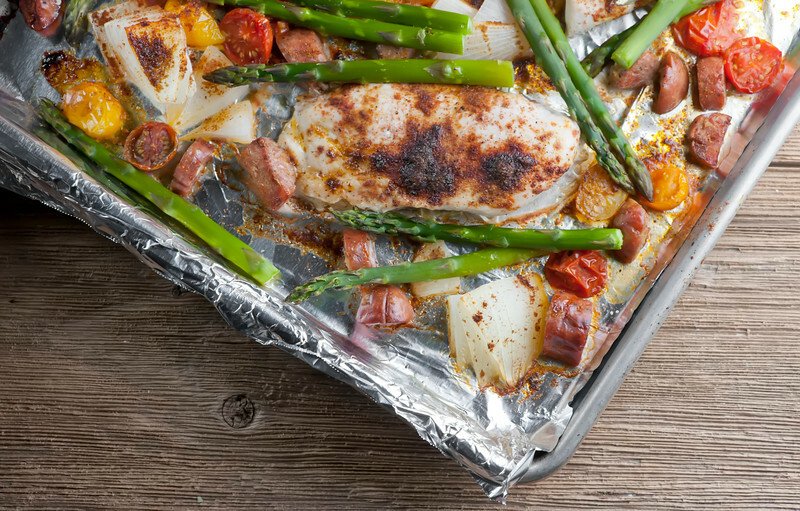 The basic principle is exactly the same: you line a rimmed baking pan with some foil, add boneless chicken breasts and veggies and a few spices, and roast it up. About a half hour later, dinner is served. It’s seriously that easy. But this time I happened to have some sausage in my fridge, and one thing led to another (which is how SO many of my recipes are born.) I also always have sweet Vidalia onions in the house (because, Southern husband) and I also always have cherry tomatoes (because I love them). This was looking very promising, but I wanted some green in the mix too, and so I added some asparagus to the mix. A little olive oil, some spices and I was ready to roll. Now, the spice mixture and the sausage are what adds the sass to this recipe, and that part is totally flexible depending on how spicy you like things. Personally I am a spice wimp – I always buy the mild version of things like taco sauce and salsa – so I went with kielbasa sausage the first time I made this, and Aidell’s chicken and apple sausage the second time. If you are not as wimpy as I am, you could try chorizo sausage which will definitely amp up the heat. As for the spice mixture, you could also add a teaspoon or two of chili powder to my paprika/cumin/salt/pepper mixture. You be you. One way or the other, you are going to nestle everything but the asparagus together on your trusty sheet pan, and roast it up for about 15 minutes. Then slide it out and add the asparagus and roast for another 15 minutes. (We don’t want the tender asparagus to get too mushy). And….that’s it! Dish it out, making sure everyone gets their fair share of chicken, sausage and veggies. I like to slice up the chicken, but you can also serve it whole and leave folks up to their own devices. And after supper you just toss the foil, give the baking sheet a good rinse, and put your feet up. Happy sigh. 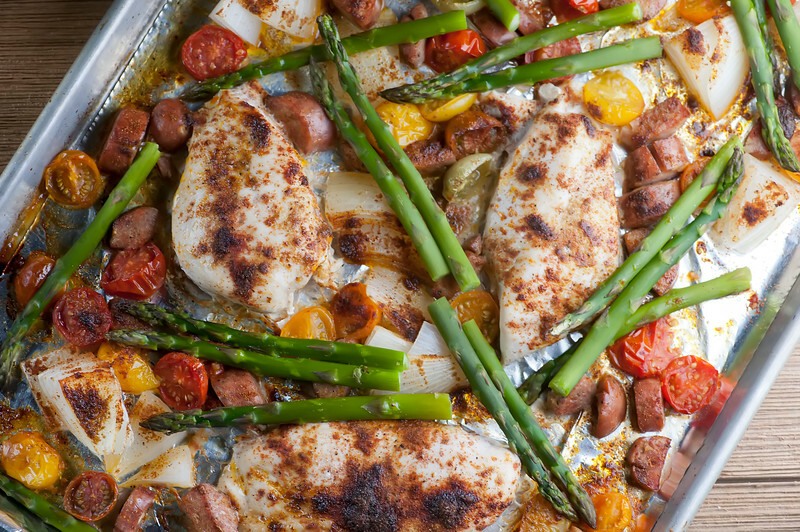 This quick recipe for spicy sheet pan chicken and sausage features cherry tomatoes, asparagus and spices, all on one easy to clean up pan! Preheat oven to 400 and line a rimmed baking sheet with foil. Place the onions, tomatoes, sausage and chicken on the baking pan and drizzle with olive oil. Combine the spices and season everything generously with the spices, especially the chicken. Roast for 15 minutes and then add the asparagus. Roast for an additional 15 minutes or until chicken registers 165 on an instant read thermometer. Divide among plates, drizzle with a little more olive oil and serve! Love the ease of this recipe! The chicken and vegetables look so tasty, such a perfect summer meal! This looks delicious and is perfect anytime but especially on busy weeknights. It simple to make, easy to cleanup, and healthy. This sheet pan dish is great all around! I do love sheet pan dinners – not just for the deliciousness but for the clean-up! My husband is going to love this meal Kate! And I’m going to love how easy it is. He’ll actually even eat the asparagus! He’s a work in progress!